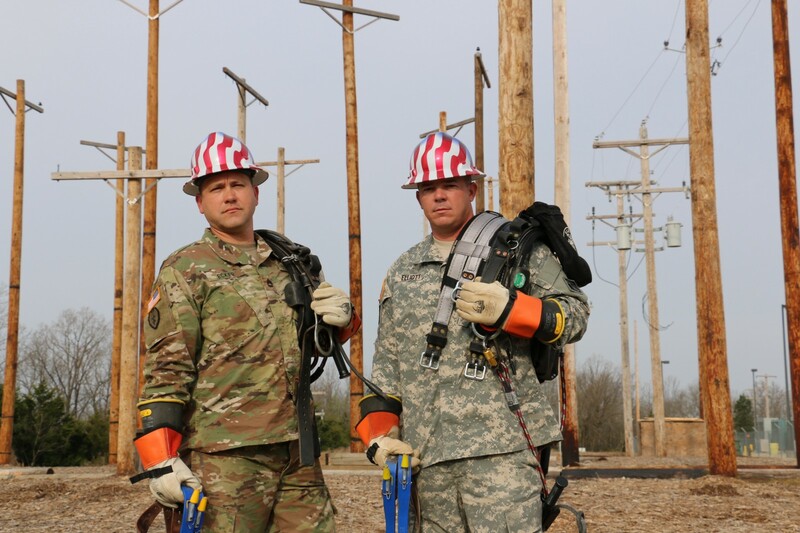 U.S. Army Corps of Engineers Prime Power production specialists with the 249th Engineer Battalion, who have earned their lineman skill identifier at the U.S. Army Prime Power School, Fort Leonard Wood. Back in July of 2017, when the military defense bill was passed, the defense budget was set to $696 billion for the fiscal year of 2018. In addition, a newly established threat to our national security was written into the bill. 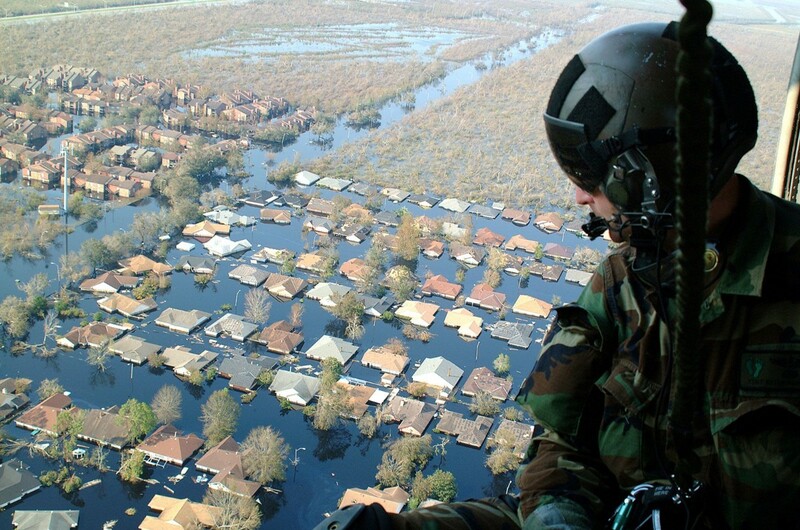 That threat is the threat of climate change, and now more than ever the U.S military is experimenting with ways to adapt to global warming. Every branch of the military is now adapting by implementing more energy efficient practices into all operations carried out. The military has played a key role in shaping our use cases for new technologies as well as educating the trades necessary to advance them. Whether it’s the GPS navigation on our phones, the microwave oven in the kitchen, or the watch on our wrist, we interact with tools and technology trickled-down from the military every day. With the military’s focus of attention now gearing towards the tools and trades necessary to achieving energy efficiency, the United States stands to benefit from a whole new trickle-down of sustainable practices. The Army nominated themselves to take part in the NZ Pilot Installation Initiative to incorporate energy and water use and solid waste generation. 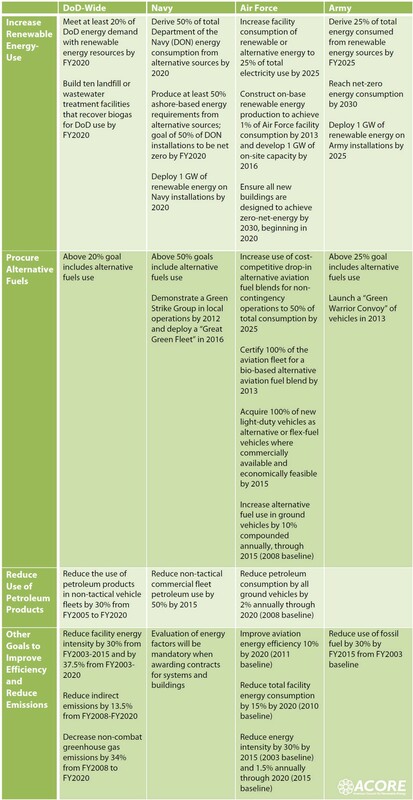 Take for example the military’s Net Zero (NZ) Initiative. The initiative spawned in response to energy-related federal mandates and executive orders from the Bush era. This response brought together the Department of Defense (DoD) and the Department of Energy (DOE) to study Net Zero Energy Installation (NZEI) pilot sites for each branch of the military. The Army accelerated this initiative by decentralizing it in order to apply the NZ concept towards all Army Installations with a goal of bringing overall consumption of resources down to an effective rate of zero by 2020. The American Council on Renewable Energy’s diagram of all renewable energy plans set out by the DoD, Navy, Air Force, and Army. The NZ initiative is just one of many plans involving renewable energy use in conjunction with energy efficiency. Research and development into plans and initiatives declared are being carried out and applied by every branch of the military. In doing so, a new standard for how energy is produced and used is forming. Along with the standard for energy efficiency being improved upon, the military’s training for the trades necessary to maintain the standard is also growing. Meaning that the United States could potentially witness the majority of trickled-down sustainable practices coming from the veterans applying their learned skills and trades from the military towards improving upon the energy efficiency standards on their own home soil. There are approximately 2 million energy efficiency jobs in the United States, with a highly projected employment growth rate. These jobs are a great fit for any veteran who has recently served and is now seeking employment. Organizations like Troops to Energy help prepare veterans by translating their skills working with energy in the military to the work done by a public utility. The International Brotherhood of Electrical Workers (IBEW) has fully endorsed the employment of veterans to the utility workforce as they value the trades and skills possessed by each veteran that is already required by the industry. With the utility workforce’s high turnover rate of nearly 40 percent, the training and recruitment for veterans working in the industry are crucial. The onslaught of hurricanes in the past three months has proven climate change to be an even more relevant, powerful, and dangerous threat the National Security of the United States and its citizens. Fortunately, the initiatives set out by the military and the veteran manpower working to upgrade society to a higher energy efficiency is taking full effect to combat this threat.